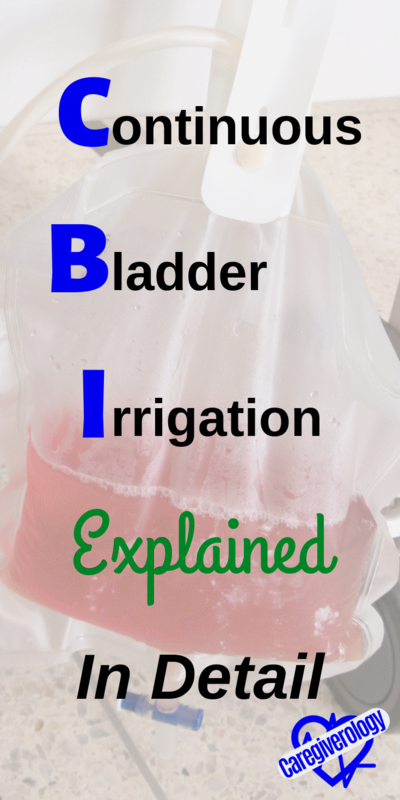 Continuous bladder irrigation (abbreviated as CBI) is a common procedure that is often done after a transurethral resection of the prostate (TURP). Of course this can only be done on males. However, a transurethral resection of the bladder (TURB) can be done on both males and females. The name itself explains what the process does but has some similarities to having a traditional double lumen foley catheter. Click the link for more information on that topic or click one of the links below to jump to that section on this page. The main difference the patient will most likely notice is how much larger the french (or size) of the tubing is by comparison. Instead of the traditional one way (or single lumen) catheter for a straight cath, or a two way for an indwelling, this one has three lumens. This is because not only are you emptying the bladder through one, but you are also infusing normal saline (NS) solution into another. 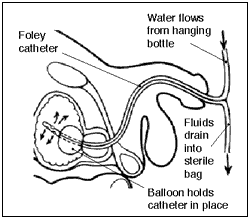 The third lumen is used to inflate a balloon, once the catheter is inside the bladder, to keep it in place. The bladder is then irrigated very rapidly with the solution in order to flush it out. I've had to empty the foley bag multiple times in one shift equating to thousands of mLs of output. Because of this, you have to be very careful as to empty it often enough to where it doesn't overflow. The solution bags themselves are three times larger (3000 mL) than the typical 1000 mL IV solution bags. Even so, depending on how quickly the irrigation is supposed to be, you may go through multiple bags in one shift. To aide in this, there are typically two different spikes to hang two bags at once. Once one is running nearly empty, that bag is clamped off and the other one is unclamped. This is to allow the continuous bladder irrigation to be truly continuous, even while hanging a new bag. There should always be one full bag hanging just waiting to be unclamped. Just make sure the clamped bag is clamped tightly or else some of the solution will transfer from one bag to another instead of all of it going straight to the bladder. The bags will have the amount of solution left labeled in order to know how much has already been infused and approximately how long until the bag will need to be replaced. It is best if the bag is clamped before emptying completely in order to reduce the amount of unnecessary airflow into the bladder. You do not connect it to an IV pump. Therefore, it is difficult to calculate an accurate rate of flow. Unless there is a specific desired rate given by a doctor's order, observation of the color of the drainage and amount of clots will determine whether the flow should be increased or decreased. A manual dial, located between the solution bags and the patient, is used in order to do this. Twisting the dial up on the tubing toward the solution bag increases the flow, while twisting it down towards the patient decreases it by kinking the tubing. What Should the Color Be? The desired drainage color varies depending on the patient and procedure but typically should be slightly pink. Hematuria, or blood in the urine is actually desired, at least at first. This shows that the procedure is doing what it is intended to do. The slight pink shows that blood is still being flushed out of the bladder, but isn't draining too slowly for clots to form. As time passes, the color should slowly fade to clear signifying that the bleeding has stopped. If the patient is having excessive pain and the bladder isn't full, they could be having bladder spasms. This is when the bladder muscles are contracting uncontrollably. There are medications, such as Ditropan, that can be prescribed and given to help alleviate this. A overly full bladder will also cause pain and discomfort. This may happen when the irrigation is not running fast enough and causes blood clots to form. If this happens, the irrigation will likely either slow down or even stop completely. A bladder scanner can confirm if this is the case. In order to combat this, a manual irrigation may be required. A manual irrigation, otherwise known as a hand irrigation, is done by flushing the bladder manually with sterile water with a piston syringe. This syringe is larger than your average 10 mL flush syringe. Most of them can hold 60 to 70 mLs of solution. Gently pushing the solution in and pulling back on the syringe helps break up the clots that are causing the back up. If the clots keep coming, keep pumping and emptying that syringe. The less clots inside the bladder, the better. Multiple flushes may be required. I have taken out many clots with this technique when done correctly. Just make sure you aren't applying too much suction on the bladder wall or attempting to pull out more solution when there isn't any left. If there is an exceptional amount of resistance when pulling back on the syringe, apply more solution and try again. This can get messy if you aren't careful. Disturbingly enough, I have actually seen a nurse get the solution and blood mixture splashed in her face while attempting to do a manual irrigation. Horrifying, even to watch. Wearing personal protective equipment (PPE), such as an isolation gown and face shield, while doing this isn't such a bad idea. The amount of output should at least equal the amount of input. If this is not the case, there is likely a blockage. Make sure the catheter itself isn't kinked. It could be if the tubing is under the patient or caught in between a bed rail or simply twisted. 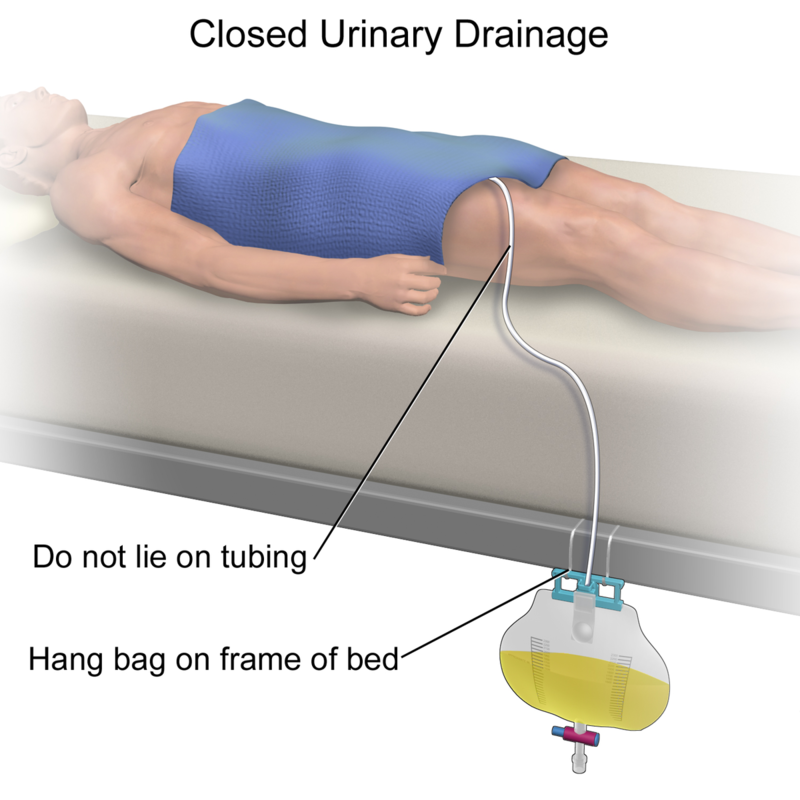 You also want to make sure the drainage bag is below the level of the bladder typically on the side of the bed. Do this by hooking it either on the frame, or some hospital beds even have a special hook on the side made for such things. This allows gravity to assist with the draining and prevent backflow. If manually irrigating the bladder doesn't do the trick and the output is still minimal, scanning the patient's bladder with a bladder scanner will determine approximately how full the bladder is. 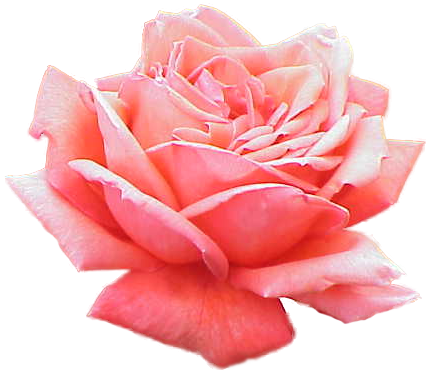 If one is not available, simply palpate the bladder area for firmness and distention. A stabilization device, such as a leg band, stat lock, or tape attaches to the patient's leg and keeps the tubing from being pulled and tugged. Just make sure the tubing has a little bit of give between the leg and the bladder as to not cause excess resistance. This is unless the doctor desires the tubing to be taught. This may be the case at first in order to maximize the effectiveness of draining the clots, but may give an order to loosen the resistance for a more comfortable experience once the amount of clots lessen.